The Sony A65 is a new interchangeable lens camera that uses Translucent Mirror Technology to offer high-speed shooting and a smaller body size. The 24.3 megapixel A65 features up to 10fps burst shooting, shutter lag of 50msec, 1080p Full HD movies with continuous autofocus and full manual control during shooting, 15-point auto-focus system with 3 cross-hatched sensors, Quick AF Live View, a 3-inch free-angle LCD, an XGA OLED electronic viewfinder with 2359k dot resolution, 3D Sweep Panoramas, Dynamic Range Optimizer and HDR, built-in GPS, and an ISO range of 100-16000. Compared to a conventional DSLR camera, Translucent Mirror Technology has a fixed, translucent mirror that splits the optical pathway between the main image sensor and a separate phase-detection autofocus sensor, and offers a simplified mechanical design that enables the camera to be smaller. 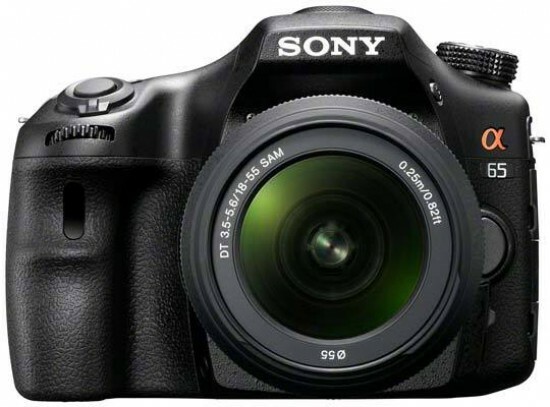 The Sony A65 costs $900 in the US and £800 in the UK for the body only, and about $1000 / £900 for the body and 18-55mm zoom lens. 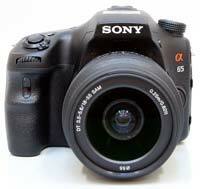 Outwardly the new Sony A65 is very similar to the last-generation A55 model. As with its predecessor, the A65 dispenses with an optical viewfinder in favour of an electronic version, and uses a fixed semi-translucent mirror instead of the moving non-translucent mirror of a DSLR. The translucency of the A65's mirror means that enough light can pass through it to the sensor to allow it to remain fixed in place at all times, with the ability to reflect some of the light onto a phase-detection auto-focus array that sits in the top of the A65 body. This combination means that the A65 can offer full-time DSLR-like focusing speeds, even during video recording, plus an excellent Live View system with 100% scene coverage and an amazingly fast continuous shooting rate of 10fps, whilst being physically smaller and lighter than a comparable DSLR. Measuring 132.1 x 97.5 x 80.7mm and weighing 543 grams, the Sony A65 is bigger and heavier than the A55, but quite a lot smaller and lighter than the range-topping A77 model that was launched at the same time. The plastic-bodied A65 is intended to be a cheaper, mass-market alternative to the enthusiast-targeted A77, whilst being a step-up model from the A55, and in terms of its size and construction it neatly fits in between the two. Although it feels a little plastic-y in hand, the A65 is still a solid bit of kit with build quality that's on a par with rival DSLR cameras in the same price range - ultimately it's neither cheap enough to put you off or solid enough to contend with more pro-level models, which we'd imagine is exactly what the Sony engineers were aiming for. The Sony A65 can shoot full-resolution 24.3 megapixel pictures at up to 10fps whilst maintaining continuous auto focus and auto exposure, an impressively fast rate for such an inexpensive camera. To achieve the full 10fps you need to set the exposure mode dial to the dedicated burst mode, which locks the exposure at the start of the sequence. You can set the aperture, shutter speed and ISO by changing to Single focus mode, but you then lose the ability to refocus between frames. The standard Continuous Advance drive mode provides a burst rate of 8fps or a lower speed of 3fps with the ability to change the exposure as required between frames. The A65 can shoot up to 13 raw files or 11 raw + fine JPEGs in a single 10 or 8 frame burst. 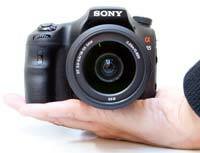 The A65 features an adjustable rear 3-inch LCD, still a relative rarity on a digital SLR. This is bracketed at the bottom and can be tilted down and then swivelled to the left and right through 270 degrees, and can also be flipped around to face inward to help protect it from scratches. The A65 also has a clever eye level sensor that switches off the rear screen's info display as you bring your eye close to the excellent optical viewfinder, plus a facility that automatically flips the same display through 90° should you turn the camera on its side to shoot in portrait fashion. One advantage that the Sony range still maintains over either Canon or Nikon is that the A65 features built-in sensor shift image stabilization, hence no need to spend extra on specialist lenses to help combat camera shake. On the Sony A65 light sensitivity stretches from ISO 100 all the way up to ISO 16,000, with a quasi top speed of 25,600 achieved by taking and combining six frames at once (JPEG only). The continuous shooting speed of 10fps at full resolution when using the EVF or in Live View mode is amazing for a mid-range camera, especially one with so many megapixels, while Sony's long-standing D-Range Optimizer and HDR functions help to even out tricky exposures, for example where a bright background would normally throw the foreground into deep shadow. GPS tracking is turned on by default. The A65 has an integrated GPS receiver which records the location and time of every picture that you take. You can then view your images on a map with the supplied PMB software, or on a BRAVIA TV via the Photo Map function. In practice the A65's GPS works well, not taking too long to fix the signal and then consistently tagging your images, except indoors and in built-up areas with tall buildings. Otherwise it's a well-implemented and appealing feature that adds another way to share your photos, or simply to help you remember when and where they were taken. The A65 can record 1080p HD 1920 x 1280 pixel movies at either 50fps or 25fps (PAL), or 60fps and 24fps (NTSC) in the AVCHD format, or 1440 x 1080 pixels at 30fps/25fps in the MPEG-4 format, useful as this format can currently be shared more easily. There's also a 640 x 480 VGA mode at 25fps, but no 720p mode. There's a limitation of up to 29 minutes, or 9 minutes if SteadyShot is turned on, for the AVCHD format, and a 2Gb file size for MP4 video. Stereo sound is recorded during video capture, and you can fit an optional external stereo microphone to further improve the quality. The HDMI port allows you to connect the A65 to a high-def TV set, but only if you purchase the optional HDMI mini-cable. As with Live View, continuous phase-detection AF is possible whilst shooting movies on the A65, a distinct advantage over most DSLR cameras and fast enough to rival Compact System Cameras like the Panasonic Lumix GH series. It allows you to track fast-moving subjects without having to resort to manual focusing, ideal for users who are used to compacts that can auto-focus for both still and moving images. There are a few caveats - the focusing can be heard on the soundtrack, although using an external microphone gets around this, it sometimes struggles to keep up with the subject, and more notably the shallow depth of field that's inherent to a large-sensor camera produces noticeable and often unwanted "jumps" as the AF system locks onto different subjects in the frame. In addition to continuous AF and manual, the selected AF Area can be changed within the frame to easily create the professional "rack focus" effect, where the focus moves between the background and foreground subjects. Also pleasing is the new ability to change the shutter speed or aperture during recording with Program, Aperture-priority, Shutter-priority, and fully Manual recording modes all on offer, a big improvement on the A55. Exposure compensation, creative styles, picture effects, white balance, AF area, tracking auto-focus and metering mode all apply equally to stills and moving images too. You can also focus manually for both stills and video, with two Focus Magnifier zoom levels (5.9x or 11.7x) on offer to assist you in judging the focus point. Of even greater help is the new Peaking function, first seen on the NEX-C3 compact system camera. This function visually indicates the areas of focus by highlighting the most contrasting areas in one of three colours, with three different sensitivity options (high, mid, or low) determining the level of contrast. 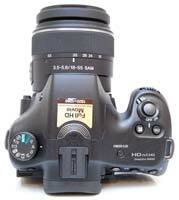 As you'd expect, it's also possible to focus manually with the Sony SLT-A65. When focusing manually, Sony offers two Focus Magnifier zoom levels to aid in determining the precise point of focus, either 5.9x or 11.7x. 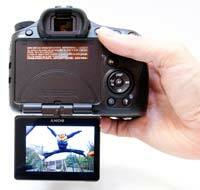 Also included is the "focus peaking" display which was first introduced in the NEX-C3. Peaking is a new feature that provides a level of hand-holding for manual focus users. When turned on to one of the three levels (low, mid, high), this essentially draws a coloured line (red, white or yellow) around the areas of highest contrast in the image when you're manually focusing the camera. Used in conjunction with the magnified focus assist, this makes it a cinch to focus accurately on a specific part of the subject, something that the majority of digital cameras have struggled with. It can even be used in the movie mode, again providing a real boon to your creativity. From the front the Sony A65 looks unthreatening to the novice DSLR user. Apart from a familiar ridge housing the pop up flash above the Alpha lens mount, its most distinguishing feature is the traditional handgrip complete with leather-look rubberized covering that extends around the side of the camera. It's easy to fit three fingers around the handgrip and makes it straight-forward to hold the camera steady for shooting handheld. Built into the grip itself is a narrow sliver of a window for the remote sensor, should use of one be required as an optional extra. At the top of this grip, but still at the front, is the camera's one and only control/command dial, situated beneath the main shutter release button and on/off switch, where it falls readily under the forefinger. 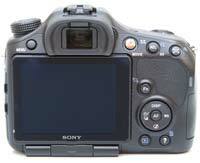 In the absence of any top-mounted LCD window, users can twist this to rapidly scroll through screen menu options and folders, a task also achieved in slower, steadier fashion by tabbing through the same using the familiar four-way control pad at the rear, as well as adjust apertures and shutter speeds. The small Depth-of-field Preview button is located at the bottom-left of the lens mount. Over at the other side of the lens mount we find a comfortably large button to release the lens, adjacent to which is a self-explanatory slider switch for alternating between auto and manual focus. Sony has subtly incorporated instances of its Alpha trademark 'cinnibar' (orange to the rest of us) colour on the camera, here only visible in the Greek symbol for Alpha that makes up the logo and a thin line encircling the lens surround. The Alpha mount also offers compatibility with A mount lenses from the Minolta and Konica Minolta range, Sony having bought up that company's expertise wholesale in 2005 to launch its own range. The A65's top plate features the aforementioned shutter release button encircled by an on/off switch that visually apes the zoom levers found on some compact cameras. The shutter-release has a definite half-way point, with the focus points (a choice of 15) rapidly illuminating green in the viewfinder and a confirmation bleep signaling that focus and exposure has been determined and the user is free to go on and take the shot. With an imperceptible shutter delay, a full resolution JPEG is committed to memory in just over a second in single shot mode, a RAW file in three. The Exposure Compensation and ISO buttons are very handily positioned to provide quick access to two features that you will use all the time, although you can change their default settings to one of 23 other options if you so desire. 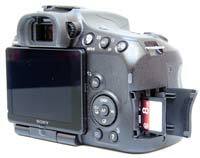 Next on the Sony A65 we come to the Finder/LCD button alongside the pop-up flashgun and a large curved grille for the built-in stereo microphone. If choosing 'Finder' with the camera set to auto-focus, bringing your eye level with the viewfinder and sensor below will neatly prompt the camera to automatically focus on whatever it's aiming at (you can turn this feature off by disabling the Eye-Start AF menu option). Pressing the same button again switches to the LCD, automatically blanking out the viewfinder with the rear screen bursting into life instead. As expected the Sony's top plate also features a shoe for an optional accessory flash situated just above the electronic viewfinder, with a dedicated button to manually release the pop up flash situated just in front. The built-in flash can also trigger an optional wireless accessory flash. Over at the far left of the A65's top plate is a shooting mode dial that's slightly sunk into the bodywork, thus helping to prevent the dial accidentally slipping from one setting to another when placing into or retrieving the camera from a bag. Arranged around this are 12 selectable options, running from full Auto and Auto+ to the creative quartet of Program, Aperture Priority, Shutter priority and Manual, plus dedicated modes for the 10fps continuous shooting, Panorama (normal or 3D), Flash Off and a Scene option which includes pre-optimised scene modes for common subjects such as portraits, landscapes, close ups (macro), sports, sunset, night, night portraits and handheld twilight. The Auto+ mode goes even further than the standard Auto, automatically recognizing the correct scene mode and then taking advantage of the camera's high-speed shooting capabilities to shoot and combine up to six shots to produce images with greater dynamic range and lower image noise. At the rear of the A65 we find the free-angle 3-inch LCD screen, which has an impressively high resolution of 921,600-dots, 16:9 wideangle ratio and can be adjusted for brightness. While the ability to both tilt and rotate the screen is very welcome, placing the bracket at the bottom does make it impossible to attain the video-friendly side-on position that some other rival models offer, a real shame considering the A65's video capabilities. 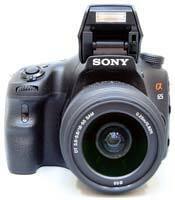 Instead of the bulky optical viewfinder of a conventional DSLR, the Sony A65 has a smaller electronic viewfinder. The mere mention of an EVF is usually enough to elicit loud groans from any serious photographer, as they have traditionally been poorly implemented in the past, with low-res, grainy displays that were only really suitable for still subjects. That's simply not the case with the A65 - the OLED electronic viewfinder on the A65 is even better than the A55's already excellent EVF, and far better than any previous system that we've used. It has a large 1.09x magnification, 100% field of view, and a staggeringly high 2,359,000 dot equivalent resolution, resulting in a display that's virtually indistinguishable from a more traditional optical viewfinder. As the EVF is reading the same signal from the image sensor as the rear LCD screen, it can also display similar information, with a choice of five display modes. For example, you can view and operate the A65's Function Menu, giving a true preview of the scene in front of you and quick access to all the key camera settings while it's held up to your eye. The various icons used to represent the camera settings are clear and legible. The icing on the viewing cake is the clever built-in eye sensor, which automatically switches on the viewfinder when you look into it, then switches it off and turns on the LCD monitor when you look away. The A65's EVF system also performs very well indoors in low light, typically the scourge of most EVFs which have to "gain-up" to produce a usable picture, resulting in a noticeably grainier picture. The A65 doesn't suffer from this unwanted effect at all, making the A65's electronic viewfinder the equal of and in many areas better than a DSLR's optical viewfinder, particularly those found on entry-level models which are typically dim and offer limited scene coverage. The truest testament to the A65 is that I almost exclusively used it by holding it up to eye-level, something that I wouldn't do unless the EVF was of sufficient quality. The only negative that we found with the A65's EVF was a tendency to block-up the shadow areas in order to maintain detail in the highlights, but this is a small price to pay for what is an otherwise amazing viewfinder. To the left of the viewfinder is a button marked Menu. Press this and a number of shooting and set up folders appear on screen, with white text on a black background aiding visibility. The two shooting folders allow users to select image size, ratio and quality and - if JPEG (RAW and RAW+JPEG also available) - compression rates too, plus features like SteadyShot, long exposure and high ISO noise reduction - all in fact activated as a default, as is the likes of the eye start feature. The Movie folder contains the video quality and audio options, while the four Customise folders allow you to tweak the A65 to your way of working. Playback, Memory Card, Time and two further Setup folders allow the likes of the LCD brightness to be adjusted, the help guide to be turned on or off, plus user languages, folders and file numbering to be specified. To the right of the viewfinder is a small wheel for dioptric adjustment that isn't too stiff and rigid. Just below and to the right of this is a welcome dedicated button for one-touch movie recording. A second marked AEL locks the exposure and also doubles up as a means of zooming into images and magnifying detail when in playback mode, while a third activates the rather pointless smart teleconverter function, which is essentially a 1.4x and 2x digital zoom for 12 megapixel JPEG images only. Thankfully you can more usefully re-assign this button to focus magnification. To the right of the A65's LCD screen is a Function ('Fn') button for those details that we'd expected to find amidst the menus but didn't. Here for example we find the Drive modes, Flash modes, along with Autofocus modes (a choice of single shot, auto or continuous), AF area (wide, spot or local), Object Tracking, Face Detection, Smile Shutter, ISO speed, Metering (multi segment, centre weighted or spot), Flash compensation, White Balance (including a custom setting), DRO/Auto HDR, plus Creative Styles and Picture Effects. Creative Styles are pre-optimised user selectable settings which run from the default of 'standard' through the self-explanatory vivid, portrait, landscape, sunset and black and white. For each of these creative options, contrast, saturation and sharpness can be individually adjusted. Picture Effects are a range of 11 creative effects that can be previewed on the LCD screen or electronic viewfinder and applied to both JPEG stills and movies. Beneath the Function button we find a familiar four-way control pad. Ranged around this are settings for switching on or off the on-screen display, selecting from the white balance settings, Picture Effects (if in JPEG mode), and single shot/ burst capture, self timer or bracketing options (three shots at 0.3EV intervals). At the centre is a 'AF' button that comes in particularly handy when scrutinizing the screen in Live View mode. Press this and, as with a press of the shutter release button, the camera will automatically and rapidly determine a point of focus for you. Underneath these options is a playback button for the review of images and a self-evident trash can button for deleting images on the fly, which also doubles up as the Help menu button, essentially a mini in-camera user guide aimed at beginner users. On the left of the A65 is a HDMI output in order to hook the camera up to an HD TV (the cable is once again an additional purchase) alongside the expected USB connection, both protected by the same rubber flap, and a DC In port. Above are ports for a remote control and an external microphone, the latter potentially allowing better sound quality to be recorded than via the camera's built-in stereo microphones. There's also a GPS logo to indicate that this camera has built-in GPS. Two partially recessed metal eyelets on either side of the body allow the supplied camera strap to be attached. On the bottom of the camera is a shared compartment for a choice of either SD or Memory Stick to save images to, a lithium-ion battery that supplies an impressive life-span of 510 images with the viewfinder or 560 images in Live View mode, plus a metal tripod socket that's in-line with the centre of the lens mount.